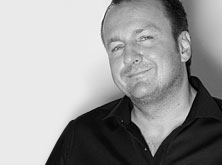 HOCK – Style in motion was founded by creative master- mind Kristof Hock in June 2009. Before setting up his own company, Kristof was a product developer and also worked as an acclaimed concept developer at various international agencies, where he created numerous advertising campaigns. A true perfectionist with a passion for sophisti-cated and minimalist design, he came up with the idea of developing and manufacturing extraordinary fitness and exercise products in Germany in mid-2008. Within just a year of their launch, HOCK products had won the ISPO BRANDNEW Award in 2010. They were also nominated for the German Design Council design award in 2011.